The original inspiration of Casa Arroyo was to build an architecturally designed ‘Tower House’ with million-dollar views. In 2002 this vision was taken to a reality with the help of local architect Hector Gomez who has designed many of the luxury homes on the desirable north side of Sayulita. Casa Arroyo is a remarkable house that is as beautiful as it is functional. 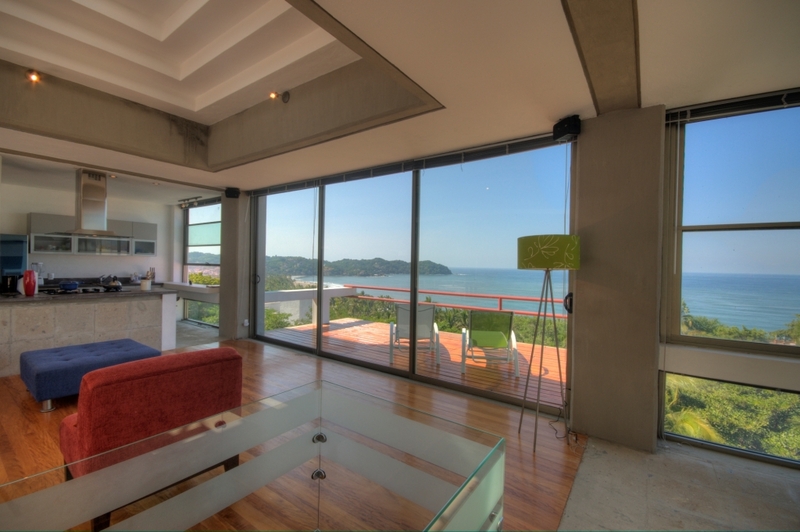 Featuring amazing views of Sayulita, you can clearly see the surf break, amazing sunsets and even enjoy whale watching from the balcony, bedroom, or kitchen. With modern architectural design elements found throughout the house, mixed with modern fixtures and furniture, you have a unique and elegant home that is comfortable and luxurious. The steel beam, rebar and concrete construction of this house has created an incredibly strong and stable house that is designed to handle the natural environment with ease while reflecting its luxurious and industrial style. With two units, a studio downstairs and a 2 story one bedroom, one bath on the top two floors, there is space enough for a large family, multiple couples, or even the potential to live in one unit and rent the other to generate cash flow. There is also additional space available at the back of the lot where you could build two additional rooms if you desired to maximize the return on investment with additional monthly cash flow. The spacious garage is on the lowest floor and has room for 4 cars and additional storage and could be re-purposed to house two cars as well as a personal gym, a recording studio or any other creative ideas with minimal effort. In addition, there is a Jacuzzi hot tub that backs up to the jungle hillside, with its own separate outdoor bathroom and shower that also acts as a changing room or an extra bathroom for when you are entertaining guests. The house has a water purification and filtration system installed that purifies and filters the municipal water from Sayulita and makes all of the water that comes out of every tap, shower and sink in the house safe to drink. The house is at the end of a dead-end drive nestled between the lush jungle hillside and a small arroyo, or creek. The neighborhood is very quiet for Sayulita and even though you are still walking distance to all that Sayulita has to offer, you are far enough away to miss out on the many sounds of the nightlife and music from the town center. email her directly at fioraaston@me.com. You can also use the Contact page. Thank you.